Woven mats of rice straw traditionally used to cover floors in Japan. Tatami (畳 )(originally meaning "folded and piled, tatamu ") mats are a traditional Japanese flooring. 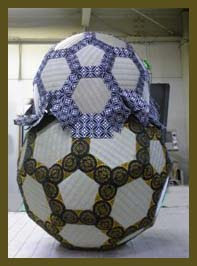 Made of woven straw, and traditionally packed with rice straw (though nowadays sometimes with styrofoam), tatami are made in individual mats of uniform size and shape, bordered by brocade or plain green cloth. Tatami were originally a luxury item for the wealthy at a time when lower classes had mat-covered dirt floors. Tatami were gradually popularized and finally reached the homes of commoners towards the end of the 17th century. 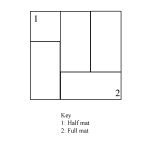 There are various rules concerning the number and layout of tatami mats; an inauspicious layout is said to bring bad fortune. In homes, the mats must not be laid in a grid pattern, and in any layout there is never a point where the corners of three or four mats intersect. In Japan, the size of a room is typically measured by the number of tatami mats (畳 -jō, joo, jou). The traditional dimensions of the mats were fixed at 90 cm by 180 cm (1.62 square meters) by 5 cm (35.5 in by 71 in by 2 in). Half mats, 90 cm by 90 cm (35.5 in by 35.5 in) are also made. Shops were traditionally designed to be 5½ mats (8.91m²), and tea rooms and tea houses are frequently 4½ mats (7.29m²). Because the size is fixed, rooms in traditional Japanese construction measure in multiples of 90 cm. Mats from Kyoto (Kyo-tatami, Kyoo datami) and other parts of western Japan are slightly larger than those from Tokyo and eastern Japan at 95.5 cm by 191 cm (1.82m²; 37.6 in by 75.2 in). 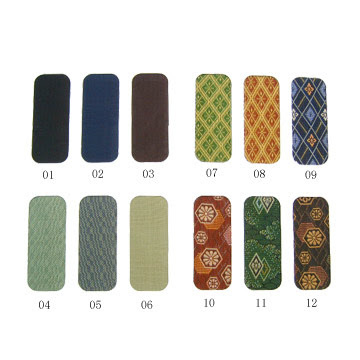 Edges for tatamis come in many patterns for different occasions. Tatami is made with a rush plant, igusa.
. igusa 藺 (い) rush, Binse . This was done as one of the preparations for the New Year. The topmost woven mat was first changed (bottom up) and when this part was worn out, a new mat was used to fix on the straw insulation core . New Tatami and new wife are needed every 10 years! "A wife and tatami are best when new!" The Japan Tatami Industry Promotion Association will host the country’s first ever “memorial service” for the straw mats by burning them in Kyoto’s Shojokein Temple on Thursday. The burning ritual will start at 2 p.m. and last about an hour, after which new mats will be presented to the first 20 visitors. This temple is located near Rozan-Ji. Founded by Emperor Seiwa　清和天皇 in 860. This hokku is from sometime in the summer of 1821 and exists only in the copy of Issa's Eighth Diary made by Issa's follower Baijin. The hokku is a bit difficult to interpret, since this is the only hokku in which Issa speaks of a single tatami floor mat, and Issa's house in his hometown burned down in 1827, so the floor plan of the house is not known. More research by historians is needed on this point, but as a general rule each room with a tatami straw mat floor in the farm houses of moderately wealthy farmers (as Issa's father was) had 4-8 tatami mats or even more. On the other hand, small storage spaces usually had no windows, and the floors were of wooden boards. In addition, the room with a hearth in the center of it tended to have a board floor, perhaps with thin straw mats on the boards. Issa's father's house also had a small stable in or near it, since his father not only farmed but rented out pack horses. Perhaps Gabi can enlighten us on the typical use of tatami floor mats in farm houses. In any case, I take Issa to be writing about his psychological and spiritual condition living in the half of his father's house that he inherited. The summer of 1821 was a difficult time for Issa and his wife Kiku, since in the fourth lunar month (May) she came down with a bad case of gout. When she did, Issa rushed home from a student's house and nursed her for about four months until the symptoms disappeared. Although Issa didn't keep a detailed diary during this time, it is very likely that Kiku's mother and probably another woman to help her came to Issa's house and also helped nurse Kiku. In addition, since Issa couldn't travel, many visitors came to see him, and he must have been extremely busy doing all sorts of jobs. In this situation, with Kiku lying sick on a mattress all day, the rooms of Issa's house must have been filled with people and things, with little space left for just sitting and enjoying cool breezes. Perhaps during this time Issa had only a single mat's space to himself for his writing and for cooling off and sleeping. Usually a single mat -- just large enough for a single person to sleep on -- would seem cramped, but now Issa finds it more than enough. It seems as big as a whole house to him now. His mind is on helping his wife recover and, probably, on working harmoniously with his mother-in-law, and he no doubt fans his wife often on hot days. The size of his personal space just doesn't seem as important as it usually does. The fact that he is in his own house with his wife and some of her family may cool him psychologically just as much the evening breezes do. gama/kama is a reed that grows near lakes and rivers. It is a mat woven with bamboo stripes and quite cool to lie on.
. WKD : Tao Yuanming 陶淵明 . He wrote this haiku just after the war, when this young woman sat there on an old mat, in the middle of all destruction, yet still emanating the feeling of the energy of the lush greenery of June. They are woven from Makomo reed. makomo 真菰 wild rice; water oats. 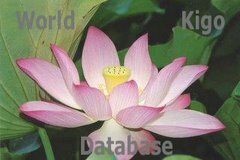 They were already used in the Heian period. Komo is reed matting or a rush mat. In traditional Japan, a person's age increased by one year at the beginning of every new spring. Now Issa is fifty. When I first read this haiku, I didn't grasp what Issa meant by having no "reed mat" (komo) over his head. Shinji Ogawa explains that this is an idiom for "never being a beggar." He translates, "spring begins/ without being a beggar/ fifty years." Issa's humor lies in the fact that he seems to be bragging about so little: that he has managed to stay at least one step above street beggars crouching under their mats when it rains. a straw mat, who is he? Written on the New Year's day of 1690 元禄3年元日, Basho age 47. Basho stayed with a haikai at Zeze after finishing his trip to "Oku no Hosomichi". This refers to the spring in "flower capital" of Kyoto. 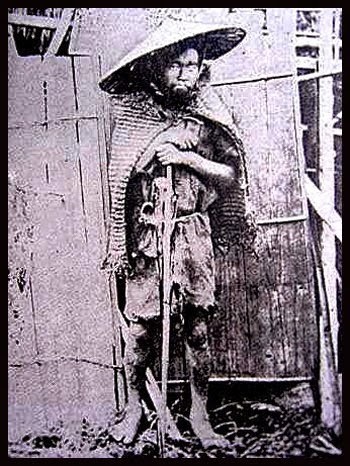 A begger might wear a straw mat, but so might be a sage or sacred hermit. A straw mat was the winter cover for the poorest of beggars (kojiki, kosshiki こつじき / 乞食) at that time. This was a time when he started to experiment with the style of karumi 軽み lightness.
. WKD : konjiki, kojiki, kotsujiki 乞食 beggar, Bettelmönch . The original haiku ends with the phrase, "it's become a moonlit night" (tsuki yo nari keri). The moon-gazing is implied. Other moon watchers sit on fine tatami mats, but one poor participant (Issa?) sits on a soot-stained one. For all, it's the same moon. with a tatami robe !! Tatami bound in black-and-white Korai-beri were restricted to kugyo, while those of higher rank (members of the royal house, princes of the blood (親王), the regency houses, and jusanguu 准三宮 sat on tatami bordered in colorful 繧繝端 (read both ugen-beri and ungen-beri). For further detail I recommend 鈴木敬三編『有職故実大辞典』. For illustrations of Korai-beri, 『日本国語大辞典』. As an example, when visualizing the Genji scene in which Hikaru Genji has an audience with the "Korean" prognosticator, artists invariably seated the young prince on mats trimmed with ungen-beri (here's the scene in a Tosa School Genji album from the British Museum (1945.1101.0.60.1-108). There are a dozen or so examples of Korai-beri in emaki illustrations indexed in 『新版絵巻物による日本常民生活絵引』, including this scene from the late-Heian/early Kamakura 餓鬼草紙 (TNM; Google 餓鬼草紙). This haiku has the prescript, "Sensô Temple." Branches of the shikimi tree are placed on Buddhist graves. The coins are temple offerings.